Our Bookstore Marketplace listing website will help you to read your favorite books store on online in one place, where there is a massive collections of e-books with unlimited books store categorization with latest trends chapters and with advanced features, since last a decade the peoples are not willing to buy the books or publishers from the shop, because they don’t have time to spend on the favorite novel by going out to buy a book, and also we are in the digital world all the users have their ownelectronic gadgets to daily update their knowledge or to read the favorite books from their place or at anywhere from their device, so it is necessary to have our Digital bookstore script for publishing the books or to have book store directory. In our Book store listing script we designed with professional e-book publishing store script with the user attractive templates, and with unlimited books categorization to make reliable functionality to the user, the new users who like to sign-up their account can submit their valid mail id and password, and they can log-in at anytime and can search for the book by using our advanced search bar filter by just clicking their favorite books categories, and preferable languages. The user can access the site without any guidelines steps or help and the visitor can view the total users, books, reviews count on middle of the home page and also with the top books with their ratings. 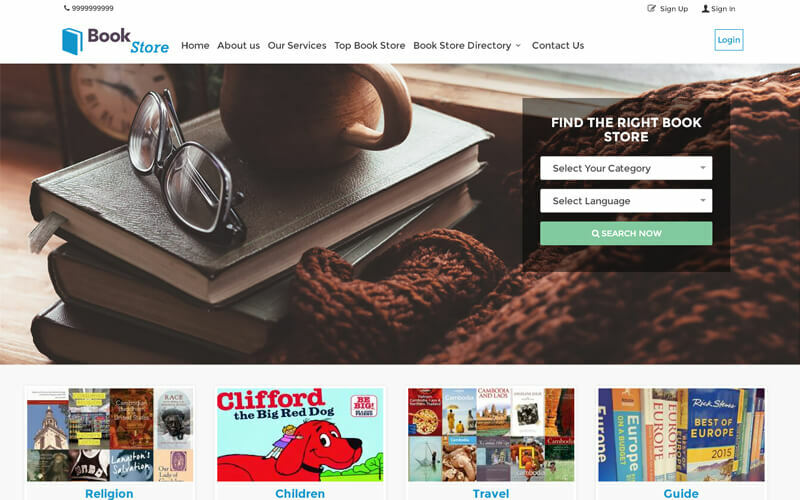 In our Php book shop website script the visitor can select and view their purchase books with the author name, category, written language, and with author short description and then bookspurchase price, rental priceand they can add their favorite books to the cart to order the book and can keep track of the ordered details via mail. We are sure that this php bookstore discovering script will be your favorite book store directory site to find your preferable authors books. The admin can look up the site and take the functionality and management role to manage the credentials of the registered users, book store, review accounts, also he can add or delete the user feedback, user appointment and ad management. The admin can also get profit and commission from the publishers and by using revenue model like Google Ad sense, banner advertisement etc.